In this weeks parsha, Parshas Chukas, we are introduced to the laws regarding the para adumah, or the red heifer. The complex, seemingly strange ritual surrounding the process of killing and burning the para adumah include using various types of branches and wool to burn with the animal. The example of the para adumah is generally used as the classic chok, a commandment that transcends any understanding or logic that humans might attempt to attach to it. In the Gemara, the para adumah is brought up in an interesting context. When giving the example of the person who most perfectly honored their parents, the Gemara presents a non-Jew named Dama ben Nessina. According to the Gemara, he was so dedicated to kibud av v'eim (honoring one's father and mother) that his refusal to wake his father from sleep caused him to lose a great fortune. 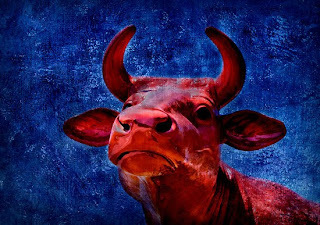 The Gemara says that because of this high level in honoring his parents, Dama ben Nissa was rewarded by receiving a perfect, unblemished red heifer, which was purchased by his Jewish neighbors for a price that far exceeded any profit he would have made in the missed business deal. The first Gerrer rebbe, the Chidushei HaRim, asks why Dama ben Nissa was rewarded by receiving a para adumah to sell to Jews. Surely the reward could have come in any form, as G-d is not limited, and the lost income could have been made up in any number of ways. The Chidushei HaRim explains that whenever the perfect example of Dama ben Nissa was shown, the malachim (angels) in shamayim (Heaven) began to criticize the Jewish people. They wondered how it could be that a non-Jew, who does not even have the requirement to fulfill the commandment of honoring his parents, could have achieved a higher perfection in the area than a Jew, who is required to observe the commandment. In response to this criticism from the malachim, G-d provided Dama ben Nissa with the red heifer, which was bought for a very high price by Jewish neighbors. The example showed that while the non-Jew Dama ben Nissa was prepared to sacrifice a large sum of money to honor his father (a commandment which is logical), the Jewish people are prepared to sacrifice an even larger amount of money to buy a para adumah, which is a mitzvah (commandment) that completely defies any human comprehension. Is this a reference to the Red Heifer sacrifice in Numbers 19:2? Other than becasue the LORD had given the commandment, and that it had to do with the law of purification I am trying to understand its purpose in Numbers. Secondly, it was a perpetual statue for Israel. When Jerusalem and the Temple were destroyed in AD 70 by the Romans was this statue made impossible to keep? Is their a search today for the ashes of the Red Heifer? The Temple will be rebuilt one day on the site where the Dome of the Rock now exists. Do you think that the Ark of the Covenant and those ashes will be discovered when that happens? It is strange that in additon to the heifer, cedarwood, hyssop, and scarlet yarn were burn also.